Reports that singer Beyoncé Knowles was killed in a car crash are a hoax. Singer Beyoncé Knowles was killed in a car crash. I swear #RIPBeyonce better not be true or the world will end. On 23 February 2015, a rumor started circulating via Twitter that singer Beyoncé Knowles had been killed in a car crash. 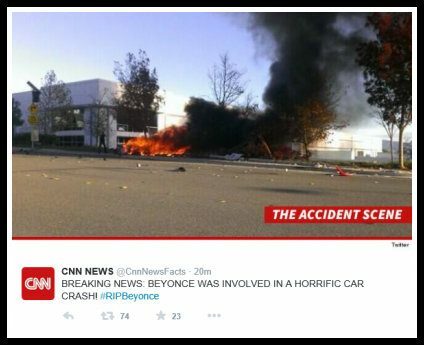 The above-displayed photo does not depict a car crash involving Beyoncé, although it does capture a celebrity fatal crash site: The image was widely circulated via Twitter shortly after the death of Fast and Furious star Paul Walker in 2013.